Are you bored of usual sounds while using Windows 7 computer? You can easily add customization to default sounds on Windows 7 by making changes to existing sound scheme. 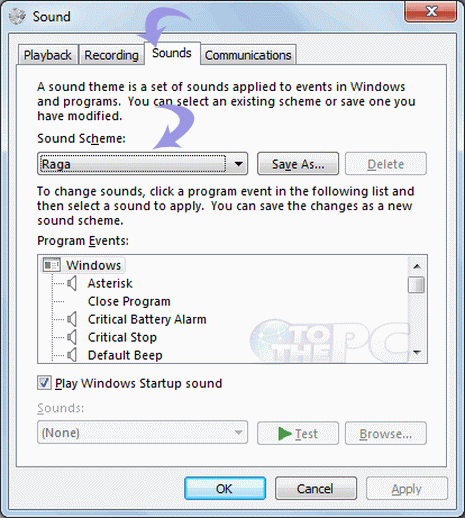 You can select different sound for specific Window’s action and even add own song to be played while using Windows 7 operating system. 1. Right click on empty space on desktop and go to personalization. 2. Goto Sounds at the bottom of the page. A window will pop up, click the sounds tab. 3. Now select the sound scheme you want for the PC from the given list. 4. If you want to change one particular sound, click on that event from the list and then click on browse. Now select any sound(.WAV format) that you want to apply for that event. 5. Click on test button if you want to test it. When done with all click on Apply. Now you have a new sound scheme for your Windows.